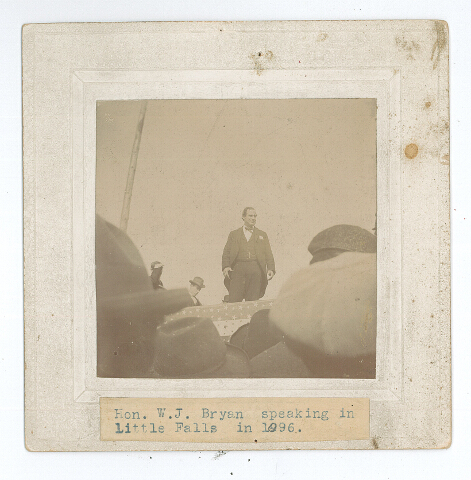 Presidential candidate William Jennings Bryan speaking in Little Falls, MN, October 13, 1896. Photo by George W. Harting. MCHS collections #0000.0.166. Populism was the watch-word of the 2016 United States presidential election. Two candidates in the race, Bernie Sanders and Donald Trump, were often described as populists, and one of them won. Populist political figures are those who speak to the average, working-class people, promising that they will shift government to meet their needs, rather than allow government to be run by and for the wealthy, the elite, corporations, or career politicians and lobbyists. Populism was not concocted for the 2016 election, though it might seem a new and modern political strategy. If we jump back 120 years, to the presidential election of 1896, we’ll find a populist candidate taking his ideas directly to the masses, an orator of great renown who is credited with shifting the ideologies of two major political parties. And, to top it all off, he made an appearance in Morrison County during his campaign, an exceedingly rare event for a presidential candidate in the county’s history. At the crux of all the chaos was one main issue: Bimetallism. The Democrats were split into two factions, “gold men” and “silver men.” The gold men were in favor of continuing with the gold standard backing the nation’s currency. The silver men (the bimetallists), which included William Jennings Bryan, wanted to have both silver and gold backing the nation’s currency, with 16 ounces of silver being the same value as 1 ounce of gold. “There are two ideas of government. There are those who believe that if you just legislate to make the well-to-do prosperous, that their prosperity will leak through on those below. The Democratic idea has been that if you legislate to make the masses prosperous their prosperity will find its way up and through every class that rests upon it. Where did this rousing speaker come from? Bryan was born in 1860 in Illinois, the son of a lawyer who was a Baptist. “[Bryan’s] fear of water was so great that it led to his decision to leave the Baptist Church and become a Presbyterian at age fourteen.” (8) His oratory skill was remarked upon by no less than Teddy Roosevelt, who connected it to his religious upbringing by saying, “By George, he would make the greatest Baptist preacher on earth.” (9) Bryan’s mother provided his education until he was 10 years old. He attended Illinois College “and graduated as the valedictorian and class orator.” (10) Then he went on to law school and got married. Bryan and his wife moved to Nebraska, where he practiced law and got involved in politics, being elected to the state’s Congress as a Democrat in 1890. That year, the Populist Party was formed in Nebraska and Bryan adopted a number of their views. (11, 12) “At the Democratic convention in 1894, Bryan was able to fuse the Democratic Party with the Populist Party.” (13) He carried this party fusion with him to the 1896 Democratic National Convention. Bryan stopped in Little Falls to campaign on October 13, 1896. “The Bryan special train reached here at 11:45 Tuesday forenoon, and the Popocrat candidate for president spoke from a stand erected on the baseball grounds near the depot. Judge Shaw introduced him.” (18) From there, the Transcript launched into a long screed taking Bryan to task for his views on bimetallism. Note the use of the term “Popocrat” to describe Bryan. It appears to be a combination of Populist and Democrat, but the Transcript seemed to use the term with a negative edge. Meanwhile, the Morrison County Democrat described Bryan’s visit to Little Falls in an article with the following headings: “OUR NEXT PRESIDENT – William Jennings Bryan Was in Little Falls Last Tuesday – Talked Twenty Minutes to About Five Thousand People – Largest Crowd that Ever Gathered in Little Falls” (19) As the 1895 census put the population of Little Falls at 5,116, the turnout, which probably included more than locals, was stupendous. Bryan went on to run for president two more times, in 1900 and 1908, but lost both races. He paid one more visit to Morrison County, speaking on Democratic issues from a train in Royalton on October 11, 1912. (23) He later served as Secretary of State under Woodrow Wilson, and was part of the famous Scopes “Monkey Trial” in 1925, arguing for creationism and against evolution. While Bryan didn’t achieve his presidential aspirations, his effect on the U.S. political system still reverberates today, particularly in his push to popularize populist ideals meant to elevate average workers. David Frum, in his July 29, 2016, article for The Wall Street Journal entitled “The Trump Before Trump” (24), makes the connection between William Jennings Bryan and president-elect Donald Trump, who campaigned and won the 2016 election with populist messages. What’s old is new again. (1) Little Falls Daily Transcript (LFDT), July 6, 1896. (2) LFDT, July 7, 1896. (5) History Matters, “Bryan’s “Cross of Gold” Speech: Mesmerizing the Masses, http://historymatters.gmn.edu/d/5354/, site accessed 12/6/2016. (7) Wolchover, Natalie, “Why Did the Democratic and Republic Parties Switch Platforms?,” Live Science, http://www.livescience.com/34241-democratic-republican-parties-switch-platforms.html, site accessed 11/2/2016. (8) Linder, Doug, “William Jennings Bryan (1860-1925),” UMKC School of Law, http://law2.umkc.edu/faculty/projects/fTrials/scopes/bryanw.htm, site accessed 12/2/2016. (12) LFDT, July 11, 1896. (13) “Roots of Progressivism: The Populists,” NebraskaStudies.org, http://www.nebraskastudies.org/0600/frameset_reset.html?http://www.nebraskastudies.org/0600/stories/0601_0304.html, site accessed 12/9/2016. (14) LFDT, July 11, 1896. (15) LFDT, July 13, 1896. (16) Morrison County Democrat (MCD), October 22, 1896. (17) “Roots of Progressivism: William Jennings Bryan,” NebraskaStudies.org, http://www.nebraskastudies.org/0600/frameset_reset.html?http://www.nebraskastudies.org/0600/stories/0601_0304.html, site accessed 12/9/2016. (18) LFDT, October 13, 1896. (19) MCD, October 15, 1896. (21) “Roots of Progressivism: William Jennings Bryan,” NebraskaStudies.org, http://www.nebraskastudies.org/0600/frameset_reset.html?http://www.nebraskastudies.org/0600/stories/0601_0304.html, site accessed 12/9/2016. (22) LFDT, November 7, 1896. (23) LFDT, October 11, 1912. (24) Frum, David, “The Trump Before Trump,” The Wall Street Journal, July 29, 2016, http://www.wsj.com/articles/the-trump-before-trump-1468607827, site accessed 11/2/2016.